The Battlefield 3 fanboy who has fueled the drama between Electronic Arts and Activision by re-directing ModernWarfare3.com to Battlefield.com has been officially revealed. Originally hidden behind Go Daddy’s Domains By Proxy (DBP) service, it appears the registrar giant doesn’t want to get involved in the domain dispute recently filed under the UDRP by Activision against the owner of ModernWarfare3.com. Today, Go Daddy’s DBP has removed the privacy service on the domain, revealing the identity of the ModernWarfare3.com owner who has entertained Call of Duty and Battlefield fans with his online antics for weeks. So who is this person who got the attention of gaming publications, fans and of course, Activision? 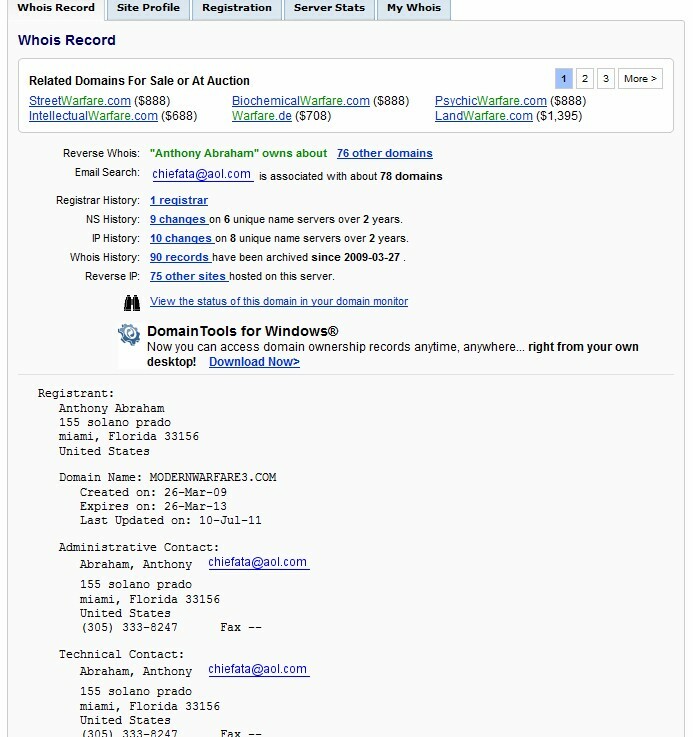 The registrant is Anthony Abraham of Florida according to the latest Whois records furnished by DomainTools. Anthony, who has been hush hush since the beginning, will likely be receiving calls and e-mails from reporters over the next few days. Now, if you’re wondering why the privacy service was removed all of the sudden, according to the Domains by Proxy website, cancelling the privacy service is just how it handles UDRP matters.